San Diego – September 17, 2018 – RippleNami, Inc., a provider of blockchain data visualization technology, and Zenaida Global, today announce an exclusive alliance leveraging their respective market strengths. 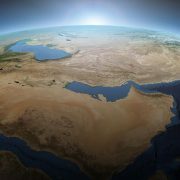 This international partnership aims to strengthen the development goals of Middle Eastern countries and streamlining the global economic coalition. By combining decades of deep experience operating in these regional markets, this partnership will accelerate the government’s economic priorities while delivering accountability and transparency through integrated technology solutions and policy alignment. 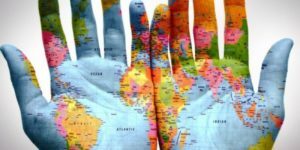 “By drawing on our distinct strengths and advancing our shared vision, RippleNami and Zenaida Global will place in the hands of countries, regions, businesses and people everywhere the rich rewards of a connected population,” said Phil Gahn, RippleNami Founder and Chief Development Officer. 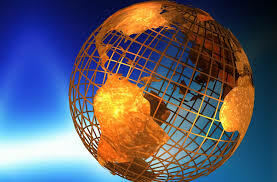 Zenaida Global’s vision is to empower clients to realize their international objectives efficiently and profitably. Founded in 2016, Zenaida is dedicated to delivering a client-obsessed and performance-driven approach to international business development. Learn more about Zenaida Global at www.zenaidaglobal.com. 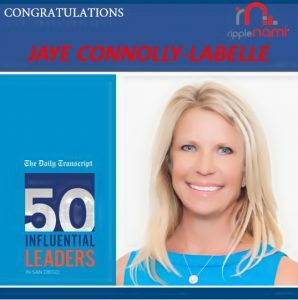 San Diego – September 10, 2018 – RippleNami, Inc., a provider of blockchain data visualization technology, is pleased to announce its Chairman and Chief Executive Officer Jaye Connolly-LaBelle is recognized in The Daily Transcript’s “50 Influential Leaders” across the San Diego business community for 2018. The Daily Transcript bestows the “Top Influential” designation on 50 community leaders driving sustained impact in the sectors that have long fueled San Diego’s economic engine. Industries include technology, biotech, real estate, construction, business and consumer services, finance and law. Connolly-LaBelle and Phil Gahn, Founder and Chief Business Development Officer, knew by taking their technology solution into developing countries, the world would forever be changed. First stop: why not Africa? Together, they took that vision and tenacity to venture into a modern day “Wild West” into Africa. 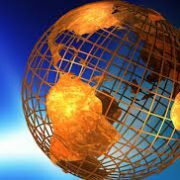 RippleNami continues to execute on connecting 5 billion unconnected people to resources and services needed with an easy-to-use blockchain data visualization solution leveraging the proliferation of mobile phones. Headquartered in San Diego, RippleNami’s offices include Africa, United Kingdom, and Southeast Asia. The San Diego Daily Transcript, also known as The Daily Transcript, is an online newspaper covering business news in and around San Diego, California. Its print origins date to 1882 when it was called the National City Record; it took on the Daily Transcript name in 1886. The Daily Transcript is the business community’s go-to publication for industry news and listings. For more information about The Daily Transcript, visit www.sdtranscript.com. San Diego – April 19, 2018 – RippleNami, Inc., a global technology company offering the first blockchain data visualization platform, announces today that its chairman and chief executive officer, Jaye Connolly-LaBelle, is a finalist in Athena’s 20th Anniversary Pinnacle Awards. This Annual Pinnacle Awards Gala is a staple in California’s technology and life sciences sectors, convening 600+ industry leaders to honor those advancing the careers of women in the Science, Technology, Engineering and Math (STEM) fields. In developing nations, girls spend six hours every day, gathering water and vital provisions rather than learning in school or working to support their families. RippleNami understands that by empowering these deserving women and children, the world will experience rapid transformation. 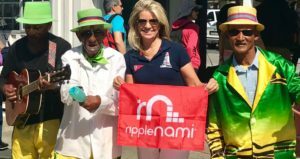 RippleNami’s mission is simple: connect the globe’s unconnected citizens with identifications, resources and services essential to survive and thrive by leveraging their proprietary technology and the mass adoption of mobile phones. Connolly-LaBelle and Phil Gahn, founder and chief business development officer, share a deeply held conviction and singular cause to drive a societal impact of this magnitude leveraging their global reach and San Diego roots. Their determination to aggressively introduce and deploy RippleNami’s proprietary technology solution into developing countries is poised to change the global landscape in unforeseen ways. First stop: Why not Africa? Next stop: Asia bound. Every year, Athena Pinnacle Awards places the national spotlight on the individuals, corporations and institutions that excel in mentoring, promoting and advancing women working in the STEM fields. Connolly-LaBelle’s 2018 nomination recognizes her as an extraordinary woman committed to helping women through her global vision and technology solution while affirming the significance of RippleNami’s bold mission. 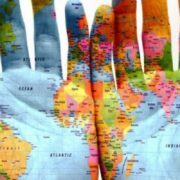 RippleNami recognizes that people empowered with real-time and easily accessible information around the world can connect and foster unimaginable change. RippleNami is redefining blockchain and mapping with the first blockchain visualization platform that consolidates big data and provides information that matters most to users and organizations. Its cost-effective, device agnostic cloud-based platform delivers millions of real-time actionable data points on an intuitive map to customers across enterprises, nonprofits and foreign government agencies that are enabling critical decision making and enhanced collaboration. With seamless integration, limitless customization and scalable architecture, RippleNami allows people to chart their own world, streamlining communication and improving operational effectiveness. For more information about RippleNami, visit www.ripplenami.com. Athena is a professional association dedicated to empowering progress together by advancing women in STEM. Athena’s 500+ member community accesses executive leadership forums, educational and mentoring programs, and targeted networking that empower women to accelerate their careers and perform at their highest levels. Athena members hold positions of senior executive, entrepreneur, educator and manager from across the STEM fields, as well as the associated service providers. Learn more about Athena. San Diego, CA…December 4, 2017… RippleNami, Inc., a blockchain data visualization solution provider, is recognized for its CEO, Jaye Connolly-LaBelle, chairman and chief executive officer, as San Diego’s Business Woman of the Year. This annual awards ceremony is hosted by the San Diego Business Journal and showcases prominent business leaders making their mark in history while elevating San Diego’s stature in the global business community. Imagine a world where all the information most important to you rests at your fingertips… a world where vast streams of data are visualized in logical and actionable fashion… and a world where anyone equipped with a mobile phone can access the powerful benefits that RippleNami’s technology is already benefiting countries such as Sierra Leone and Kenya. RippleNami is marching towards its bold vision of connecting 5 billion unconnected people with an easy-to-use blockchain and data visualization solution that leverages the mass adoption of mobile phones. Connolly-LaBelle and Phil Gahn, founder and chief business development officer, shared a deeply held conviction that driving social impact of this magnitude would be their singular cause with a global reach while leveraging their San Diego roots. Their determination to aggressively introduce and deploy RippleNami’s proprietary technology solution into developing countries is poised to change the global landscape in unforeseen ways. First stop: why not Africa? “Receiving this distinction from our own backyard is the very essence of what fast-growing global startups like Ripplenami can expect from the San Diego ecosystem. Through our innovative technology, RippleNami is quickly affecting change for women and children in developing countries. We thank the San Diego judges who selected RippleNami and acknowledging our fast track to foster lasting change,” said Jaye Connolly-Labelle, chairman and chief executive officer at RippleNami. The Annual Business Women of the Year program recognizes business leaders that are making a difference in both their workplaces and communities. 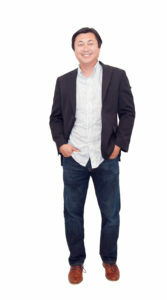 Nominees were evaluated based on their innovation, entrepreneurship, professional accomplishment and community leadership. Each year the San Diego Business Journal recognizes dynamic women business leaders contributing to San Diego’s corporate ecosystem. Now in its 24th year the San Diego Business Journal recognizes these leaders by hosting its biggest and most anticipated reception and awards program honoring the honorees and their guests. Celebrity emcees, a keynote speaker and the awards program are staples of this landmark event. Learn more about the Business Woman of the Year at www.sdbj.com/bizevents.